That’s great, but what exactly is location-based VR, and why does it matter to marketers? Location-Based VR experiences use advanced VR hardware to deliver a more immersive experience. Think VR backpacks combined with dedicated, purpose-built sets. 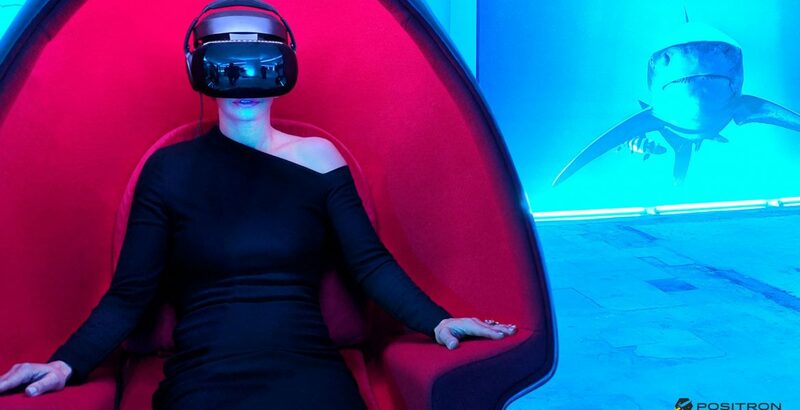 The Void is currently the biggest operator of what they’ve dubbed “Hyper Reality,” with 11 locations spread out across the US, Canada, UAE and Malaysia, and immediate plans for another 6. These types of experiences are popular with audiences, but they require permanent, expensive and custom-built sets to guide users through the experience. They’re not the type of thing that could be incorporated into any but the most over-the-top activations. Over the last 6 months or so, our agency has had the chance to experience the marketing and activation potential of location-based VR firsthand. That’s thanks to Positron bringing us in to help promote their Voyager VR Experience. Positron’s entire location-based VR system is a pod, about the size of a La-Z-Boy. Each pod is a self-contained unit that contains the VR system and headset, a base that delivers 360° rotation and pitch, haptic feedback, a scent dispenser, and interactive lighting. In short, it’s all the immersion of other location-based VR systems, in a footprint that would let you fit about 25 of them in a standard shipping container. Positron’s vision has never been to build the ultimate marketing activation tool. The company and its founders are deeply linked to the film industry, and their vision has always been delivering cinematic VR experiences in theater-like settings. The team’s well on their way to achieving that vision, but on the way, they’ve been nearly overwhelmed with demand to use their platform as a tool for drawing big crowds at activations. After months of ongoing demand (and the occasional prod from their marketing agency), Positron has finally admitted that this is likely to be a key part of their company’s growth going forward, and they’ve devoted significant resources to supporting their activation partners — which is good news for anyone looking to leverage the appeal of location-based VR activations. The best activations do two things: draw crowds and create a lasting (positive) impression of the brand. Location-based VR does both, exceptionally well. In its most successful deployments, location-based VR activation brings an experience that would be expensive (tickets to most location-based VR experiences are upwards of $30), and inaccessible to anyone living outside of one of the few cities with current permanent installations. The result is big crowds that have a great experience and come away with a very positive perception of the brand behind the activation. Great films and shows immerse their audiences, which makes immersive location-based VR experiences a natural fit for film and TV promotion. In the past two years, a handful of Hollywood blockbusters have leveraged Positron’s tech to develop immersive experiences to go alongside their premieres and events like Comicon, SXSW and Sundance. It started with the Tom Cruise, The Mummy reboot in 2017, shortly followed by immersive VR experiences for Jurassic World: Fallen Kingdom, The Walking Dead, Dunkirk, First Man, and most recently, How To Train Your Dragon 3. Positron’s VR pods are currently touring the country along with DreamWorks Animation, bringing a How To Train Your Dragon VR experience to Walmart locations in 16 cities. The only complaint so far has been that the activation’s popularity is leading to long lines – a problem I think nearly any brand activation would be glad to have. Intel used location-based VR to promote their processors at VRLA 2017. In August of 2018, HP developed a custom Mars location-based VR experience and deployed it using Positron’s chairs at SIGGRAPH 2018. The unique experience helped both companies stand out from the crowded competition and draw consumers into their booths. More recently, Verizon made location-based VR a centerpiece of their “Super Bowl Live presented by Verizon” experience around Super Bowl LIII in Atlanta. The company used the technology to showcase their upcoming 5G service. These examples are really just the start. There’s potential to use location-based VR in a huge variety of marketing activations. Advertisers have essentially two options: create a branded experience (like the How to Train Your Dragon VR experience), or use existing content and tie it to your products (like Verizon did with its 5G Super Bowl Live experience). Custom content obviously has more opportunities for brand integration and messaging. But, while technology platforms like Positron have toolkits available for developers, creating custom content certainly adds cost to hosting an activation with location-based VR. Leveraging existing content might not offer the same experience, but with a library of content already available – it’s possible to create a branded overall experience without specifically branded content. We absolutely believe that location-based VR has tremendous and lasting marketing potential. That said, there’s certainly an advantage to offering a novel experience that only a very small percentage of the public have had a chance to try. If I were planning a product activation, trade show exhibition or other event that had the opportunity to incorporate location-based VR, I’d do it ASAP. The experience stands on its own, but right now, the experience plus its newness and exclusivity are almost certain to draw and influence crowds at any event. Mike Schaffer is the CEO of Echo-Factory, Inc. Throughout the course of his career, Mike has provided strategic oversight and executive leadership for companies looking to position their businesses for growth, acquisition or both. Mike is an ongoing contributor to CSQ Magazine and a regular speaker at marketing conventions, and mentors start-ups with the USC incubator and the Los Angeles Cleantech Incubator. He also organizes the largest Innovation Group in Los Angeles which meets weekly in Pasadena.